(EN) While some people mistake Cyprus for a Greek island, others romanticize its status as Europe’s last divided country. But there is another Cyprus: it is young and vibrant and it doesn’t shy away from putting the finger into the wound. (EN) Born and raised in Nicosia and Limassol, artist Peter Eramian and photographer Stelios Kallinikou belong to the younger generation of Cypriot creatives who are reinvigorating their country’s cultural scene. Together they run the cultural space Thkio Ppalies, whose slang name alone, a Cypriot expression meaning “chop chop.” breaks with local expectations of an art space. Before translating their shared ideology into four walls, Peter was one of the publishers of The Cyprus Dossier, a free magazine that circulated an accessible and critical dialogue of the island’s cultural and political issues. Stelios, meanwhile, just released a book, Flamingo Theatre, which showcases his long term photographic documentation of the dreamy but controversial Akrotiri peninsula in Limassol, that to this day is the site of a British RAF base. (EN) What is the idea behind Thkio Ppalies and what does its name mean? (EN) Peter Eramian: Thkio Ppalies in Cypriot slang means something like, “Let’s do something really quickly”, or how they say in English, “chop chop.” It actually translates almost directly, because Thkio Ppalies literally means to cut with a big knife. For us this communicates an energy that we want to give the art scene in Cyprus. We also picked the name because it is a slang term and breaks with people’s expectations about a gallery space. Cultural institutions in Cyprus tend to imitate things from outside Cyprus, but we wanted to do something that feels more local. (EN) Is there a story about how you found this place? Is it what you were looking for? (EN) Stelios Kallinikou: It started with the idea of the two of us sharing an office, so we were looking for a place—not necessarily an art space. Then I came across a rent sign for this one and I couldn’t even imagine how it would look from the inside. So we called the owner, he showed us the place and we knew we wanted to move in. Coming back to the name and its origin: when we moved in we found a sticker outside advertising some kind of plumbing service, it said “Thkio Ppalies” to advertise how quickly they offered their services, and we immediately knew this was our name. (EN) Thkio Ppalies was also established as a space to connect like-minded people. How would you describe the local creative community? (EN) P: I think the creative community in Cyprus is really powerful and talented. Most of the young creative people I know have studied abroad, so they are aware of what is happening outside of this island. At the same time, they are producing work that is uniquely local, independent and visionary. (EN) Do you feel that being Cypriot plays a key role in the work you do? How do you see that in other artists’ practices? (EN) S: It definitely influences my personal work, but I don’t want it to be the main theme. Because being an artist in Cyprus is not an easy choice, I think the work produced here has a very specific quality, it is quite raw in a way. (EN) A lot of Cypriots study abroad, as you yourselves did. Some return, some don’t. You both came back—so was it ever a question for you either to return to Cyprus or live somewhere else? (EN) S: It’s not something that I can explain. Of course there’s always the option of living somewhere else, but I just really like being here. That’s also why my practice as an artist moves around themes connected to this place. (EN) How does the political situation of living in a divided country influence your lives and work? (EN) S: For my work the circumstances play a crucial role. All my practices are developed around the issues present here. I’d like to think that the whole island is my art studio. But don’t get me wrong, this is not because I am Cypriot and I am living in a divided country. I’m not interested in my country in a nationalistic sense. It is more that I am trying to use the conflict here as a starting point to speak about something more general in my work, about the human condition, about how we as humans negotiate with the situations around us. (EN) What was it like to live through the time of the financial crisis in 2012 and 2013? (EN) S: Of course the crisis influenced our lives dramatically. Things have been more difficult but at the same time also new opportunities opened up for artists. It also taught people to appreciate and utilize the things around them. (EN) You once said that The Cyprus Dossier would receive cynical remarks stating that there isn’t an audience in Cyprus for such a journal. Why would people say that? (EN) P: In Cyprus people are sometimes afraid to analyze things too much. Which is okay—sometimes I’m afraid to analyze things too much as well! But people here often think of intellectual discourse as either intimidating or pretentious. But actually The Cyprus Dossier was always free because we wanted to make it as accessible as possible. You might think it’s pretentious, but then it is free—so you might as well just pick up a copy and decide for yourself! (EN) Peter, you started The Cyprus Dossier in 2011 and by the end of 2015 you announced that the journal would not be continued after nine successful issues. How did you feel about The Cyprus Dossier coming to an end? (EN) P: It didn’t end for any specific reason other than the fact that it wasn’t working practically anymore. We (Marios Menelaou, Entafianos A. Entafianos and I) had all sort of grown up and committed to other jobs and projects. Nine issues seemed like a good circle for us. Right now we’re looking into the possibility of creating three hardback volumes with selected contributions from all issues of The Cyprus Dossier, an anthology of sorts. The content we collected and published over these four years is certainly very important historically as well as socially for this island, I think it will benefit greatly being published in a more durable and archivable format. (EN) Is Thkio Ppalies a continuation of these efforts in a different way? (EN) P: I think it definitely is. Not necessarily in a similar way, but with the same intensity. I personally wanted to transition to something more physical and direct. Finding a balance between the intellectual and physical state of my work, or rather translate the one into the other. Because this is what Thkio Ppalies is: an intellectual project translated into a physical space. 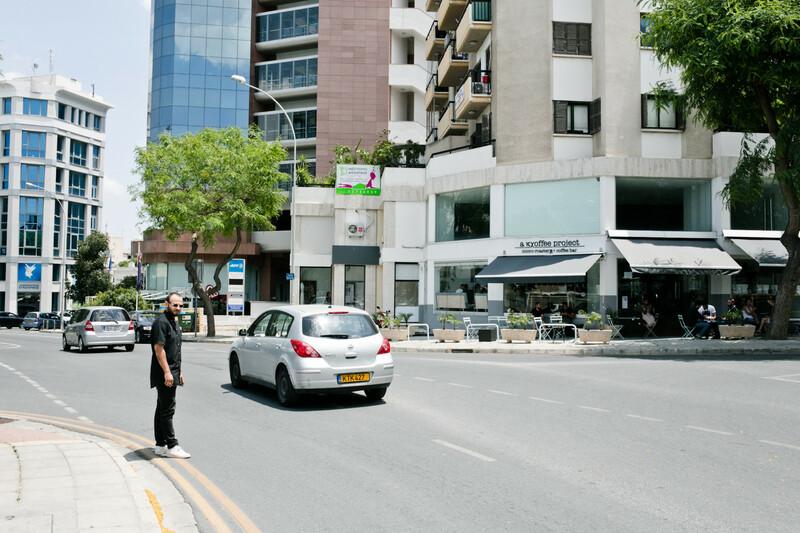 (EN) Situated between the charming old city of Nicosia and its modern but worn down commercial centre, Point, directed by Andre Zivanari, showcases contemporary work by Cypriot and international artists and supports cultural production from various disciplines and practices. (EN) Moufflon has been around for longer than the country has been divided. 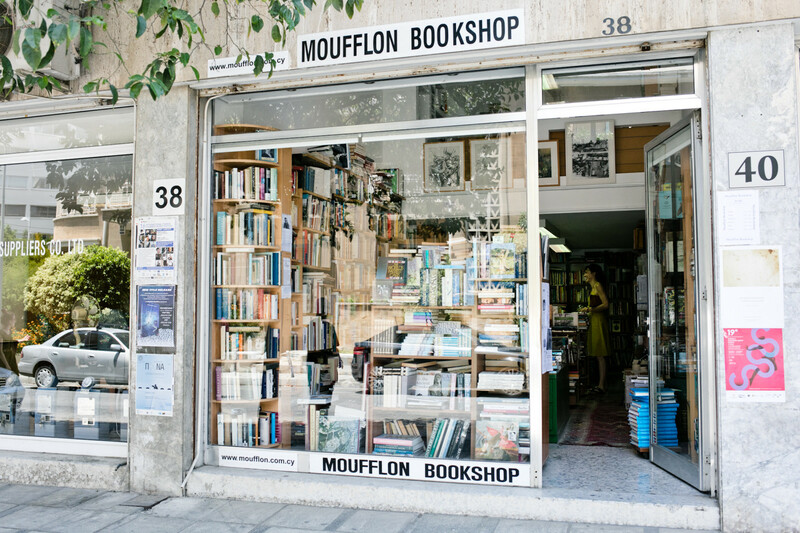 Run by Ruth Keshishian, the bookshop offers a wide range of antiquarian and specialty publications relevant to Cypriot history and culture, in English and other languages. (EN) Since 2011 Neoterismoi Toumazou (Neo Toum) has been an evolving space for exhibitions in the heart of Nicosia’s old city. 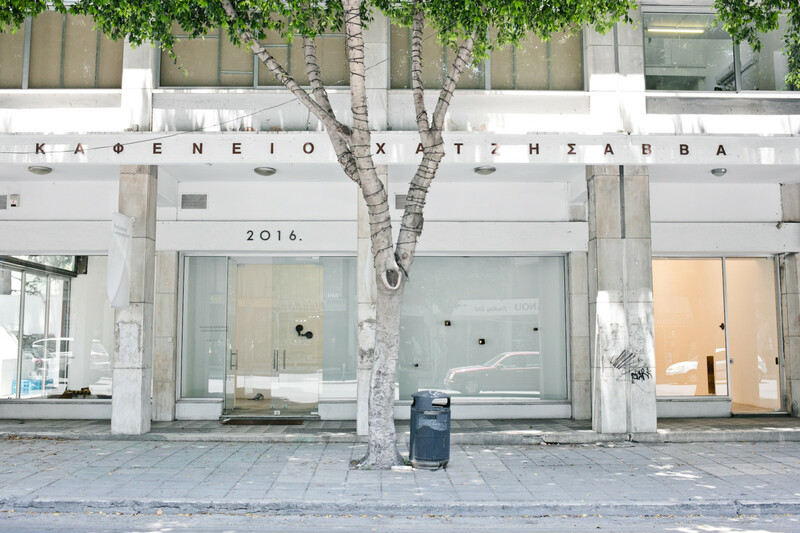 It begun as Maria Toumazou’s grandfather’s old clothing store and in 2014 along with artists Marina Xenofontos and Orestis Lazouras was turned into a gallery space with a curated program of emerging local and international artists. Neo Toum also produce fashion stories, editions and multiples related to the shop’s clothing stock. The products explore an alternative art funding model and are part of a larger concern that resonates with the obsolete local consumer industry which had once sustained the space. (EN) The third wave of coffee finally swapped over to Cyprus. Whoever likes to enjoy artisan coffee—whether hot or cold—will come to κχoffee Project just little outside of the old city. (EN) Thank you, Peter and Stelios, for showing us around your hometown and giving us such an immediate insight into your work and lives. For everyone interested in their work, visit Peter’s and Stelios’ websites. All 9 issues of the Cyprus Dossier can still be read online, and to find out about the current exhibition schedule head to Thkio Ppalies’ website.